Have you ever looked at two brands and thought to yourself, "These things seem awfully familiar?" Well, just like most manufacturers across the realm, appliance companies under the same umbrella, produce identical appliances under different names. Today, we will discuss 2 brands under the same corporation: Thermador and Bosch. Before we start, let's look at the companies. Bosch Home Appliances is part of BSH, Bosch and Siemens Home Appliance Group, based in Munich, Germany. As part of the third largest appliance manufacturer in the world, Bosch has been selling high-performance German-engineered appliances in the United States since 1991. Their factory in North Carolina is the largest appliance factory in the world. Bosch started the trend of quieter, yet more affordable dishwashers. You can buy a very decent Bosch dishwasher for $769. You can watch this two-minute Bosch video to understand a bit more. Thermador is part of BSH Home Appliances Corporation, a fully-owned subsidiary of BSH Bosch. Founded in 1916 in California by William E. Cranston, and began as a manufacturer of electric items, most notably portable, and built-in heaters. Twenty-five years ago, Thermador manufactured their own dishwashers with a patented steam process under the Thermador and Waste King name. 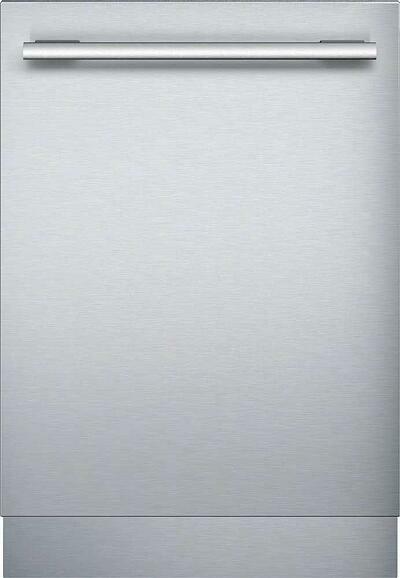 In 1998, Thermador became part of the Bosch company, and their dishwashers are relabeled Bosch dishwashers. For 20 years, Thermador dishwashers were mostly sold as free dishwashers in promotional Thermador packages. In 2018, Thermador finally decided to distinguish their dishwashers from Bosch. While the layout is fairly similar, the quality of the racks, tines, and features have become noticeably different. For the first time, they are now made in the same factory in North Carolina. In this blog, we are going to compare 4 models, two from each brand with similar prices and/or features. This dishwasher has solid features and reliability. It is all stainless steel with better adjustable racks than the plastic bottom Ascenta series of Bosch. At 44 dBs, it is also 40% quieter. It's one of the best-selling dishwashers at Yale and nationally. Exterior wise, their units look very different. This is a very sharp looking dishwasher and has a solid stainless exterior, with a choice of handles. Opening the door, you will notice that the interior is very similar in layout. Thermador revamped their previous dishwashers with sturdier racks and double dipped tines, to prevent them from rusting. One of the least focused on features is the sensor touch controls. The controls sit on a solid piece of stainless steel the unique ability to be cleaned very easily. No longer will you have to pick crud out of the gaps on the sides of the buttons on the controls. Whether the sturdier tines, Wi-Fi connectivity, better controls, and a 2-year warranty is worth the upcharge of $630, is up to you. If those features don’t seem worth it to you, we would recommend purchasing the Bosch and saving yourself $630. Of course, this all changes if you are buying Thermador cooking products. Now, let's look at the high-end models. This is not your everyday Bosch model. 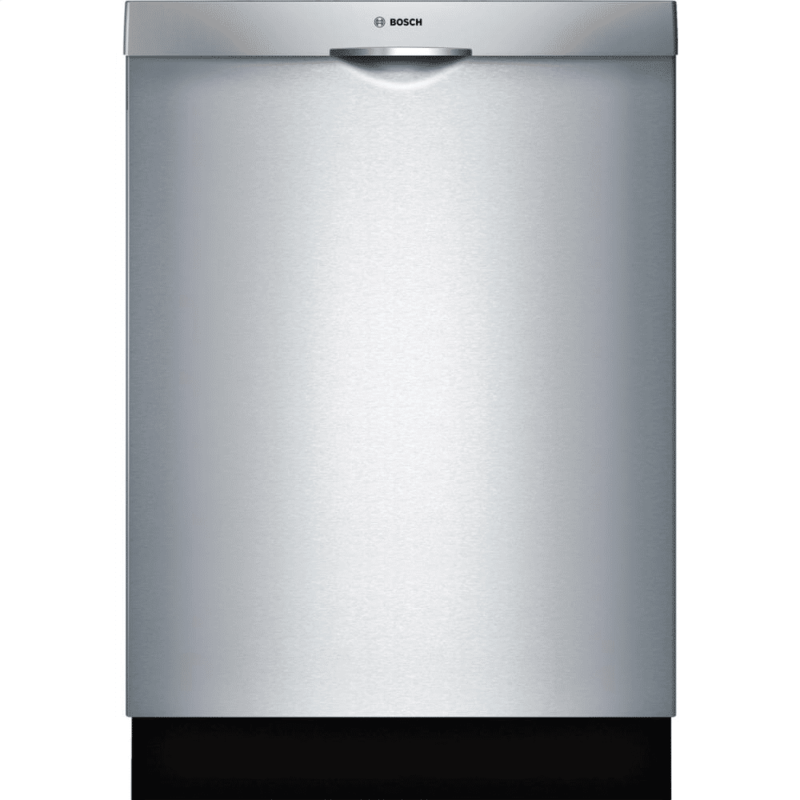 The Bosch Benchmark is the most highly featured Bosch dishwasher on the market with the most features. Some of those features are interior lighting, water softener, premium tine flexibility, and the info light that shines on the floor the remaining time left in the wash cycle. With the deeper third rack, you now have the space for all of the pesky smaller items like Tupperware, lids, and children's items that can wreak havoc on the organization of your dishwasher. This is also one of the quietest dishwashers on the market at 38 dBAs. 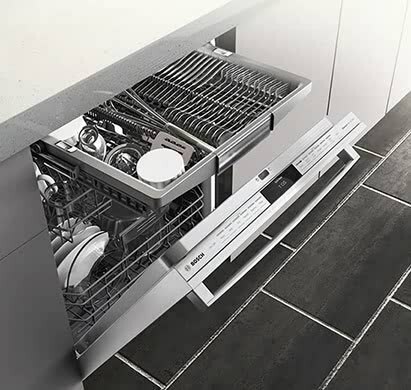 While this is the most feature filled Bosch dishwasher, Bosch has been trickling a lot of these features over to their 800 series dishwashers in the past couple of years. You can find an 800 series dishwasher for nearly half the price with the majority of these features as well. This dishwasher may be the best-featured dishwasher on the market. If you are looking for a premium dishwasher, host a lot of parties, or have a big family and would like a dishwasher with faster cycles, then I highly suggest you stop here. The new Star Sapphire has two key features that you’ll be hard pressed to find in any other dishwasher - the StarSpeed cycle and the StarDry cycle. StarSpeed uses a space in the wall of the dishwasher to store hot water. It takes about 20 minutes to warm up the hot water, and then after that, only 20 mins to wash and dry the dishes. While your dishes are washing, the dishwasher is warming up the next container of hot water so that subsequent cycles already have hot water ready to go. You can run up to 5 subsequent cycles at 20 mins each. That means that you can run 5 loads of dishes in the same amount of time that it would take to run one load of dishes in any other dishwasher. How crazy is that? The StarDry cycle is a feature you can only find in the Star Sapphire dishwasher and the regular Sapphire dishwasher. 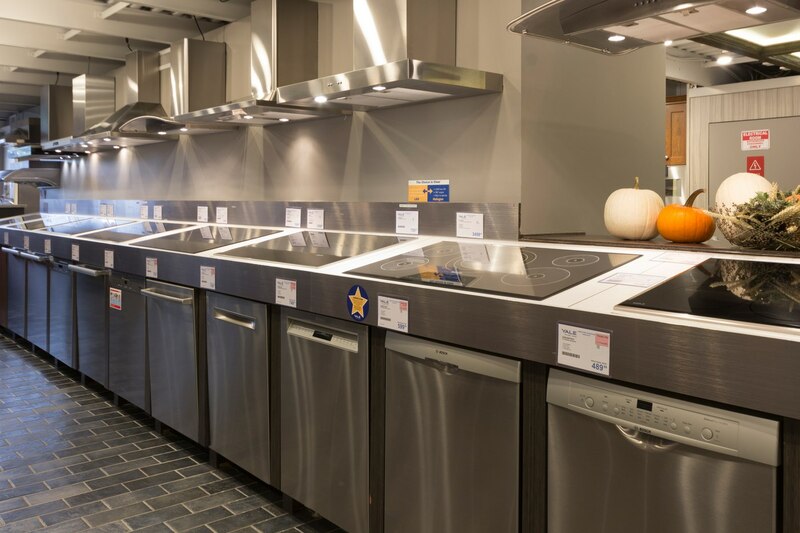 If you’ve done some research, you should know by now that European style dishwashers don’t have heated dry options due to stringent energy standards. Thermador is the only company to have found a solution. It implements a natural mineral, called Zeolite, to create a heated dry. Zeolite is a mineral that emits heat upon the absorption of water. The heat emitted by the Zeolite is strong enough to dry even plastics! Goodbye, towel-drying your Tupperware! While this dishwasher is not inexpensive, it’s the only dishwasher with this capability. The most similar dishwasher on the market in terms of speed and drying capability is the Miele Professional which retails for about $5,200. For about half the price, the Thermador is extremely compelling. Paired with the Thermador range promotion, this dishwasher is only $1,400. Yale Appliance is a servicing company, which puts us into a unique position of being able to look at our own statistics. Bosch and Thermador both fall into a service rate of about 11-17%. However, the Thermador dishwasher is now manufactured in the more reliable American factory. That being said, all these numbers should be a testament to the fact that dishwashers break. Should I buy a Bosch or Thermador Dishwasher? So, which one should you buy? Well, that really all depends. Finally, if you’re purchasing Thermador cooking appliances and qualify for a $1,400 rebate, well it would be simply silly not to cash in on that. Buy the Thermador of your choice as it will be less expensive than the comparable Bosch. The $1,399 Thermador will cost you nothing. If you are a looking for a good and reliable dishwasher but don’t care about speed, flexibility, or any other features, buy a Bosch dishwasher. Bosch makes over 80 dishwashers. Click the link for the best 6. If you would like something that is competitively priced and has some but not all of the features we described, chances are, Bosch makes it. On the other hand, if you are looking for a premium dishwasher that has a quick turnover rate and a better dry, consider Thermador. Those are the two features that you really won’t find in any other dishwasher. So Bosch will be cheaper with similar features. As a single piece, Bosch is the better buy. Buy the Thermador with other Thermador cooking products, because the rebate is $1399 and will be cheaper than the Bosch. However, the premium Thermador is compelling on its own if you want the quick, complete wash and dry cycles. Are Thermador and Bosch the same company? Yes, Thermador is a division of Bosch. What brand is the best dishwasher? The best three are Miele, Bosch, and KitchenAid. Are Bosch and Thermador high-end? Bosch is medium to high, but Thermador is premium only. Want more information on dishwashers? 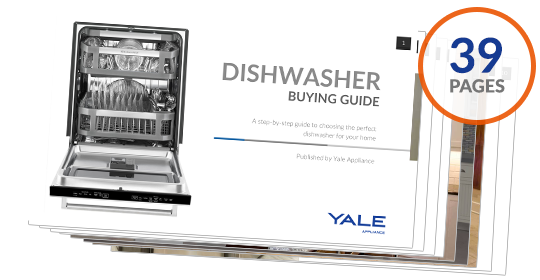 Read the Yale Dishwashers Buying Guide with specs, features, and detailed profiles of all the major brands. Over 410,000 people have read a Yale Guide. Karina Gaft is an Appliance Sales Consultant at Yale Appliance & Lighting. Karina received her bachelor's at Brandeis and is currently working on her master's at Harvard in Sustainability and Environmental Management, with a particular interest in Green Building Design. After exhausting her mental faculties with work and graduate school, Karina exhausts herself physically with skiing in dreadfully cold weather and lifting heavy items at Crossfit. In her meager spare time, Karina enjoys traveling, embarking on culinary adventures, and teaching her food-motivated cat new tricks, wishing he was a dog instead.